Bedrug makes lay down bed mats that resemble carpet but are 100% water proof. Each one is specifically cut to fit your style of bed whether you have an existing liner or a bare surface. In addition to bed mats Bedrug also has an interior lining kit for several models of Jeeps. Check out the Recently Listed Fender Covers and Track Mats. Check out the Recently Listed Truck Bed Mats and Components. BedRug is well known throughout the aftermarket, a name synonymous with high quality and innovation. Located in Old Hickory, Tennessee, BedRug got its start as a manufacturer of TPO foam composites. TPO foams offer a broad range of performance attributes ? ranging from softness and flexibility to thermal stability ? it is a closed cell construction, which will not absorb moisture, and is similar to the foam used in life jackets. It can be fabricated into a variety of parts that are suitable for exterior applications. Most importantly, it can be laminated to other substrates ? and in BedRug?s case, those additional materials include 100% polypropylene plastic non-woven "carpet" and the TPO composite that creates BedTred. BedRug is environmentally safe ? BedRug products are manufactured from a recyclable TPO/polypropylene composite. All unusable polypropylene materials are recycled into pellets and used in a wide variety of consumer goods. In addition, BedRug products do not contain any prohibited or declarable substances on the Global Automotive Declarable Substance List (GADSL). ISO9001 Certification received January 5th, 2010. ISO 9001 aims at providing an internationally recognized standard for a quality management system (QMS) using a continual improvement approach and considers customer needs and expectations.TS 16949 Certification received January 5th, 2010. TS 16949 contains all of the requirements of ISO 9001 plus several additional requirements specifically for the Automotive Industry. If you want an innovative, non-permanent bed liner that provides a padded, flat work surface with the appearance of a spray in liner, BedTred Ultra Series is for you! These 100% waterproof, custom molded die cut kits provide the convenience and comfort of a floor liner without the worry of mold, mildew or stains. They will withstand the harshest of conditions while insulating your interior from both road noise and heat. 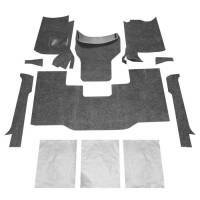 This 100% waterproof, fully custom die cut headliner kit installs quickly without the need to remove your hard top. The individual pieces can be quickly installed by removing the specially designed tape and pressing firmly into place. The BedRug material resists all harsh chemicals, and will not stain, stink, mold or mildew. The 1/2-inch polypropylene foam, will help insulates your interior from road noise and heat. This high-end, rugged liner is made for 1997-current model year Wranglers (TJ, LJ, JK, & JKU) and will give you the look of a spray-in without any labor intensive prepping. You get the convenience and comfort of a non-permanent liner that is easily installed, removed and cleaned after a long day on the trail. VanRug With its ¾" custom molded foam backing the VanRug gives you the look and comfort of carpet, in an ultra-tough 100% polypropylene (essentially plastic) product. That means not only will it protect your van, it will provide impact and cargo protection and act as a heat and noise insulator. With its ½" custom molded foam backing the VanTred provides a rugged work surface. Not only will it protect your van, it will provide impact and cargo protection and act as a heat and noise insulator. 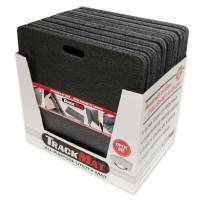 TrackMat is the perfect addition to your garage, pit or trailer. This knee-saving foldable mat is plush yet ultra-tough foam pad fused with 100% polypropylene fibers.